Treat yourselves to a "Free Donut"
Our beta release has been live for three weeks now, and it is time to announce our free plan! By announcing the free plan, all of our fans will know how far they can go with the free version of our agile project management tool. When signing up for Flying Donut you’re automatically enrolled to the “Free Donut” plan, which is our free plan of our agile project management tool. 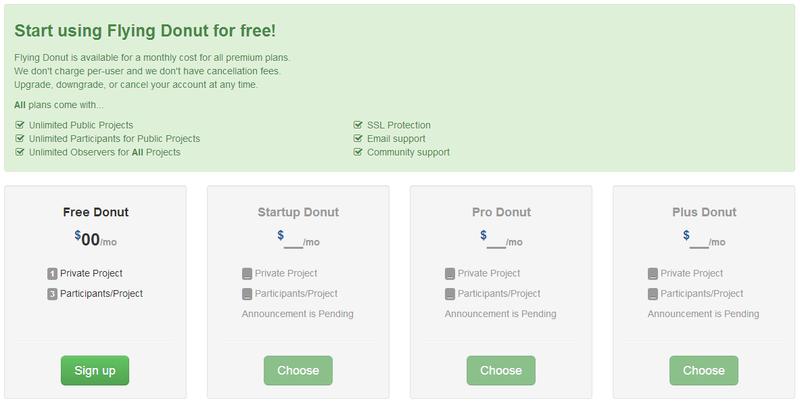 ‘Free Donut’ has a limit of one (1) private project with three (3) participants. What does that mean in practice, and how far can a team of people go with the free version? Well, if it is a team of three people, then they can reach 3 private projects with 3 users. We don’t charge per user! When the time comes, Flying Donut will charge on a private project basis and set a maximum limit to the participants of those projects. In case you’re wondering, a participant is a user that has read/write access to a project. After all, a user may be participant to one project and an observer to another. Each user can own projects and participate in projects they’re invited to. The bottom line is that the project participant limits are set according to the selected plan of its owner. In addition, Flying Donut will be free for academic institutions, and students. If you are a student or a an academic institution and you are interested in Flying Donut, contact us at info@flying-donut.com. Don’t wait until our software goes premium. You can do it right now if you wish. And of course, an agile project management software that honors itself should offer a free trial period. Therefore, when you sign up for Flying Donut, your account will automatically participate in a 30 day free trial, which allows you to create an unlimited number of projects, and invite as many participants to the projects as you’d like. At the end of the free trial, your account will transition to the ‘Free Donut’ plan, unless you have selected a premium plan. What happens to the existing beta users? Well, all accounts prior the the premium launch will enrol into the free 30 day trial, just like everybody else signing up at the same day. Of course, all data will remain intact, and no one will notice any difference. You may find more information in our pricing page. Keep in mind that Flying Donut is still in beta phase. We haven’t announced the premium plans yet. It is 100% unlimited free, until we go premium. ← Inviting all open source communities to use Flying Donut!